I’ve been on a kids’ art kick lately. 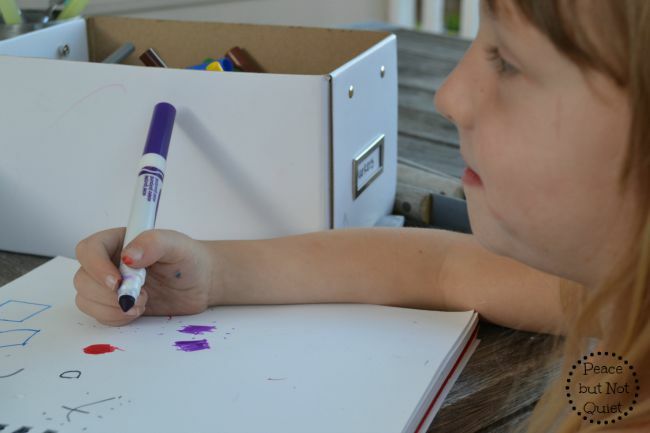 There are some really great blogs out there that just focus on inspiring kids in their artiness — Red Ted Art, The Artful Parent, and Tinkerlab are fabulous resources that have inspired me to try and do art with the kids here. And I noticed, after wandering around their sites for a bit, that several of these blogs feature games and projects using art dice. Such a cool idea! And one of those ideas that can be done a hundred different ways, depending on who’s doing it. 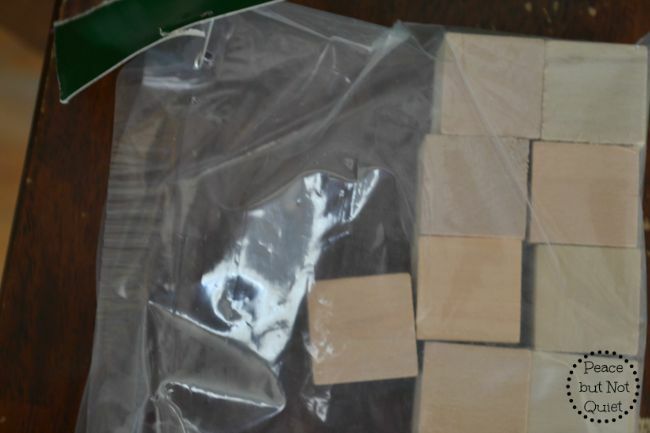 I found these plain wooden blocks at Michael’s last week. They’re available individually, but I have tons of ideas now (mwahahaha! ), so I grabbed a bag of them and used two for this particular project. My Sharpie hunt through the craft drawer unearthed this — approximately 152 Sharpies (or maybe 10. But still…) that I bought to fill various back-to-school supply lists. So yeah, we’ve got a Sharpie stash. If you don’t have your own out-of-control Sharpie cupboard, I think 4-5 different colors is about right for this project. I drew various simple geometric shapes in different colors on each side of one die, and various lines and squiggles and patterns on the other. You can use your imagination and draw whatever you’d like, but here’s what I had — a triangle, a square, a simple face, a star, a diamond, and a circle. I wish I’d made the star a heart instead because I think that’s a little easier for kids to draw — but I have all those extra blocks, so next time! 1.) Children 4 and under: Roll the dice. Practice drawing the shape and the pattern you roll. 2.) Children 5 and up: Roll the dice. 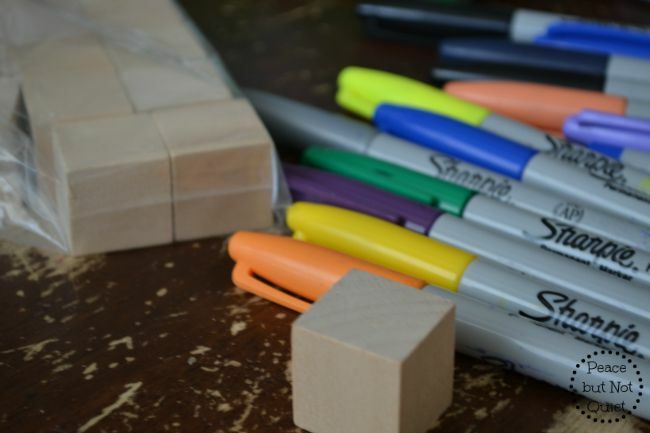 Draw a picture incorporating the shape and the pattern into your picture somehow (kind of like story cubes, where you must come up with a story based on what you roll). This is an exercise that can grow with your kids — as they get older, their pictures will just get more complex and advanced. 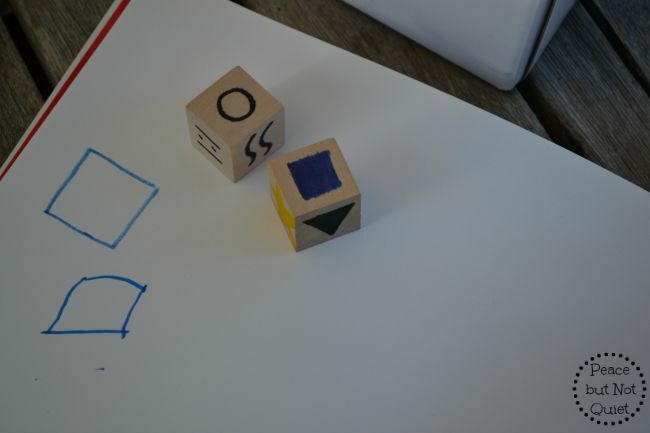 The whole process — from making the dice together to using them and drawing during our game — was a huge hit. We can bring them along on road trips, or to the doctor, or other places the kids need to be entertained. I’m definitely keeping these around, and probably adding a few more dice to the mix! 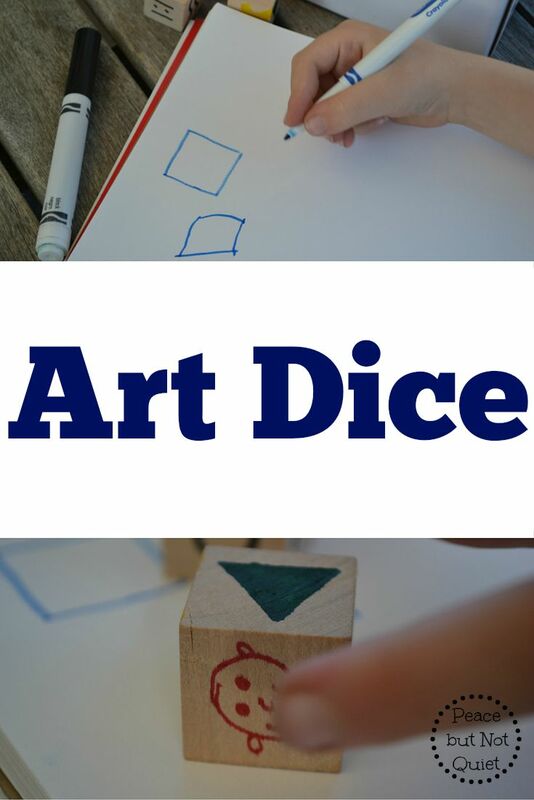 Have you used art dice? How do you use them? I’d love to hear in the comments or over on our facebook page!